Moore's office also indicated that they hoped to gather signatures of support from other members of the General Assembly. That falls in step with the legislative majority’s many attempts to block abortion access in North Carolina, including increasing state funding of fake clinics called crisis pregnancy centers to $2.3 million, a 516 percent increase. Since gaining power in 2010 the Republican majority has also made headway in reigning in the North Carolina Department of Environmental Quality, slashing its budget and refusing to adequately fund cleanup of several environmental disasters. Republicans even voted in favor of further budget cuts to DEQ just days after the story of toxic contamination in the Cape Fear River, known as the GenX crisis, came to light. Most recently, the legislature allocated $2.3 million to DEQ to assess and clean the rivers, but chose to funnel most of the appropriations to the NC Policy Collaboratory, a venture directed by a former Berger staffer. 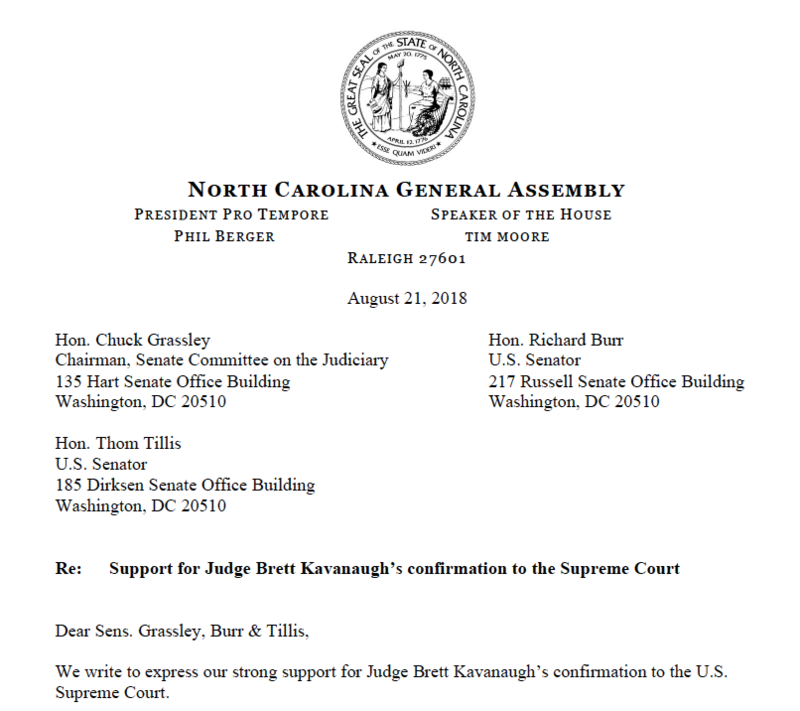 These North Carolina Republicans continue to support Kavanaugh despite the recent allegations. Update: The General Assembly has released the full list of legislators who have added their signatures to the letter. It includes all Republican legislators except for Sen. Tamara Barringer (R-Wake) and Reps. Chris Malone (R-Wake), Linda Johnson (R-Cabarrus), Chuck McGrady (R-Henderson), Larry Potts (R-Davidson), and Linda Hunt Williams (R-Wake). Find the letter here (via @LaurenHorsch).